French supplier Faurecia Interior Systems Inc. is seeking $110 million in damages from Chrysler LLC in a breach of contract lawsuit filed Monday in a Michigan state court. The supplier's suit alleges that Chrysler has refused to fully reimburse Faurecia for engineering, research & development and other up-front costs the company incurred to supply the automaker with interior systems. Faurecia supplies components such as center consoles, instrument panels and door panels for four Chrysler vehicle programs: the PT Cruiser, Chrysler Sebring/Dodge Avenger platform, Jeep Liberty and Dodge Nitro vehicles. According to Faurecia's lawsuit, Chrysler agreed to repay the supplier for up-front costs related to supplying interior products to Chrysler's four vehicle programs. The project costs were to be lumped as a surcharge into the per-piece cost of the parts for all four programs, so by the end of the vehicle's life, Faurecia would recover its project investment costs. The surcharges were to be adjusted if production volumes changed dramatically, according to the suit. The lawsuit by Faurecia is one of several disputes between Chrysler and its suppliers to become public in recent months and comes at a time when U.S. auto sales have tumbled to a 27-year low. "Faurecia has taken huge liberties in this lawsuit, grossly overstating alleged damages and totally absolving itself of any assumption of risk, contrary to our supply agreements with the company," Chrysler spokesman Mike Palese said in a statement. But Chrysler has slashed production of the vehicle programs by 46-73 percent below what it forecast when it signed the contract with Faurecia in 2004, Faurecia said in its suit. Faurecia contends Chrysler refused to adjust the price to reimburse Faurecia for its costs since at least 2007. The suit also alleges that Chrysler purchased interior parts production for a related vehicle program from a Chinese manufacturer using Faurecia's designs. Faurecia says Chrysler currently owes it $45 million in engineering and r&d costs alone, on top of interest. Faurecia is seeking an additional $58 million in damages it says Chrysler owes because the automaker did not adjust its price terms with Faurecia when it cut production of its Sebring, Avenger and PT Cruiser models. Faurecia filed the suit in Oakland County Circuit Court in suburban Detroit. 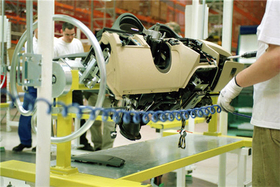 Faurecia reported 2007 sales of $2.6 billion and ranked as the 15th largest on Crain's list of the largest suppliers.